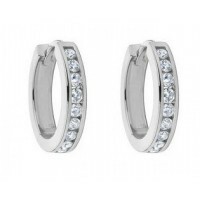 A pair of diamond hoop earrings is a must-have item in every woman's jewelry collection. 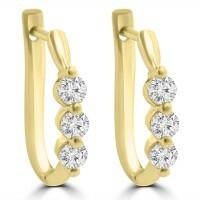 Enjoy choosing your own perfect pair of gold diamond hoops on sale from our extensive collection at MadinaJewelry.com. 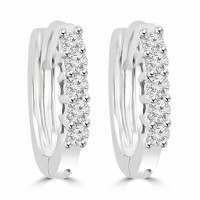 With designs ranging from small diamond huggie hoops to large diamond hoop earrings and inside out diamond hoop earrings, you are guaranteed to find a pair of diamond hoop earrings you'll love. 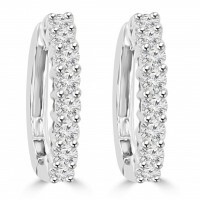 Our ladies diamond hoop earrings are made from luscious 14K or 18K gold and encrusted with shiny round, baguette or princess cut diamonds, while featuring professional pave, channel and prong setting types. 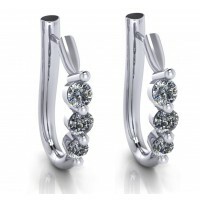 To view our full collection of women's discount. 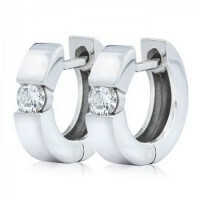 This beautiful pair of polished 14k white gold diamond hoop earrings feature posts and hinged sna..
A pair of diamond hoop earrings is a jewelry wardrobe staple, and these beautiful earrings are a gre.. 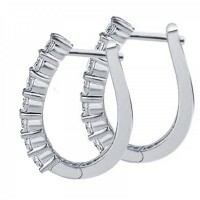 These cute hoop/huggy earrings make the perfect addition to any girl’s accessory jewelry collec.. 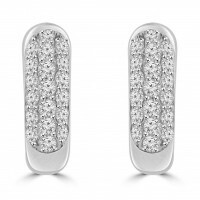 Tremendous sparkle radiates from this pair of beautiful huggy style earrings with 1.10 carat of roun..